This post is part of the month-long blog collaborative organized by Barbara at Me, My Magnificent Self. This January Challenge is about “welcoming in awakening experiences.” I chose this date for the challenge because January 5th is the Twelfth Day of Christmas and tomorrow the 6th is the Epiphany, which is the day the three Magi (wise men or astrologers), who after studying the heavens and following a specific star, visited the newborn baby Jesus. This star became known as the Star of Bethlehem. The Magi brought gifts to their new-born king, the son of God: gold, frankincense, and myrrh. Gold symbolizes kingship, value, and virtue. Frankincense symbolizes God, deities, and the Divine. Smells, perfumes, and incense are used in many different religious and spiritual practices. Smell is also the sense (of the 5 senses) that is related to the element of earth and the root chakra, Muladhara. This may reflect that the root of our Being, of our divine essence, of our souls is with the Divine of All. (Visit Symbol Reader for a great full article on Smell.) The third gift that the Magi brought was myrrh. Myrrh is a tree resin used as an oil, and it symbolizes mortality, death, and suffering. Ancient cultures, such as the Egyptians, used myrrh as a preservative embalming oil for the dead. These three gifts, though they are fittingly symbolic for a human-deity king, can also be seen as symbolic for all of us, for we are all part of the divine source, the One. The gold represents the golden light of virtue within all of us, and that each of us has value and worth. The frankincense represents the divine within each of us, which is connected and interconnected to the divine in every single one of us and everything. The myrrh represents the experiences of suffering, growth, learning, and joy that our mortal bodies and minds experience, but our souls, our divine selves, will be preserved and live on after the death of the physical. The Labyrinth at Grace Cathedral. Click to see more pics. In resonance with the Christmas Season and the New Beginnings of the New Year, I’d like to share an awakening experience, or more of an annual re-awakening or further awakening practice, that has become a tradition for me since New Year’s Eve 2005 – I do a labyrinth meditation practice. This has been a very powerful silent contemplation practice that clears and opens the way for continued and new growth each new year. On the journey into the labyrinth, I think about all that I wish to clear out, cleanse, and both want to and need to let go of from the past year. This can be physical, material, social, mental, emotional, and energetic or vibrational. When I reach the center of the labyrinth, I stand still, either in complete mental silence or I say a prayer or chant in my mind depending on the year. I stay there as long I feel I need to, until the old that I am releasing disperses, and I feel lighter. On the journey out of the labyrinth, I meditate on all that I wish to keep, continue, expand upon, grow with, and bring into and receive into my life in the coming year. I realized during this year’s labyrinth meditation, that the journey of the Magi might also have been an awakening experience. The Three Magi are believed to have travelled a long distance and must have had much time for silent meditation and contemplation on their journey. On their journey to the baby Jesus, they had time to contemplate all that life on earth had been, and what they hoped would change and be released. Meeting Jesus would have been like coming to the center of the labyrinth, where they stopped in prayer and adoration to the Divine. On their journey away from the nativity, they must have contemplated on how their world would soon change, and all the good they hoped would come into it. Journeying to the center of the labyrinth is symbolic to me of journeying deep into the golden essence of my Being, to connect fully with God, the Divine, Source, All, and the One that is within. It is an awakening experience in the clear light of awareness, that allows me to look at my life with the clarity between what Is and what is impermanent, empty, meaningless, and mortal. In walking the labyrinth, I receive the gold, frankincense, and myrrh. Whatever your religious beliefs, spiritual practices, or none of these, we all can strive to follow the light of our inner essence and wisdom, and allow it to guide us to ever more awareness. Like the Magi following the Star of Bethlehem, let us all follow our inner star, the light within us, and may it guide us all to many new and wondrous things in the new year and beyond! The next post in this challenge will be by Sarah at http://rayoflight7777.wordpress.com. Click on “January Challenge” above for the complete list. This entry was posted in Meditations, Religions & Philosophies and tagged Adoration of the Magi, awakening, death, Epiphany, gold frankincense and myrrh, Jesus, labyrinth, Magi, personal growth, self-awareness, symbolism, three wise men, twelve days of Christmas. Bookmark the permalink. what a beautiful practice – a ceremony really – and I could feel the richness, the healing that it brings to you. I will be walking the labyrinth at Chartres in France in March and will refer back to this post before I do. The Divine meets us whenever we open our heart to receive Her and She does so with grey joy and passion. I felt that here. Namaste. We all do eventually see our morning, Peace! Thank you! Yes, each person has their own journey toward awakening. Blessings and peace to you! This was a brilliant post! Thank you for sharing it..and your practice of clearing and then receiving! Wonderful post, and even at school I was always enthralled with the fact that astrologers could view the heavens and be told of events .. I was also fascinated with the gifts given and your explanation here helps me see why these 3 gifts were chosen ..
Great info. Love the idea of walking the labyrinth for New Year’s. Wonderful spiritual words and insight in this post to read today on the epiphany. My mother’s birthday is today. RIP mom. She always waited until after today to take all the Christmas decorations down. You have reminded me of what I need to do. Thank you! Happy Birthday honoring to your mom (RIP). We too always waited until today to take down the Christmas decorations. Have a miraculous new year! I love your living labyrinth idea! I’m going to add that to my visualizations of what I’d like to do when I have my own home again! Thank you and have a growth-full new year! I appreciate the frequent visits to my blog by such a knowledgeable mythologist and astrologer as you are, Julianne. I admire your work and expertise. The great scholar Ananda K. Coomaraswamy (you would love his writings, such as ‘The Dance of Shiva’, and many others), wrote: “Myth is the penultimate truth”. Also – with respect of the metaphorical language of mythology and metaphysics – “Its worlds and gods are levels of reference and symbolic entities which are neither places nor individuals, but states of being realizable within you.” Greetings. Thank you for your kind words and for stopping by! I will check out Ananda K. Coomaraswamy’s works. Have a lovely new year! It has been said of him (A.K.C. ): ‘… became a peerless authority on Asian art and, in his later years, one of the most influential exponents of the perennial philosophy which informs the world’s great traditions.’ He was curator of the Asian Collection at the Boston Museum of Art. You can find a few other quotations of him in my blog. Regards, Alberto. Great post. I find that incense helps me clear my thoughts while meditating. It also helps create a sacred space during rituals. I have a wonderful memory of when I was camping on the rim of the Grand Canyon. Wild sage was growing all around, and as I sat outside at night, watching a meteor shower, the smell of the sage transported me into a state that was truly indescribable. Lovely experience! Sage is a very cleansing herb/scent as well. Have a beautiful new year! Great writing, and so poignant for this time of year…and the photos I found in inspirational as well. Wonderful post. The Magi aren’t labelled as astrologers in the Bible, but magi are priests and priests were who studied the stars. Astrology is mentioned in several other places in the Bible, both condemningly and approvingly. Great minds think alike, Julianne. Lets journey on and let our inner light shine. Happy Three Kings! I love your insight about the Magi journeying as a meditation. I believe this to be true and symbolic. Walking frequently brings me sometimes very intense inspiration where ideas come rushing in. Sometimes I am sorry that I don’t have to do more walking as driving scares me. The Magi have always seemed mysterious to me though, great fodder for fantasy. Who were those guys anyway? They really broaden the scope of the Christ child’s birth and yet show a humility of the kings. Thank you! 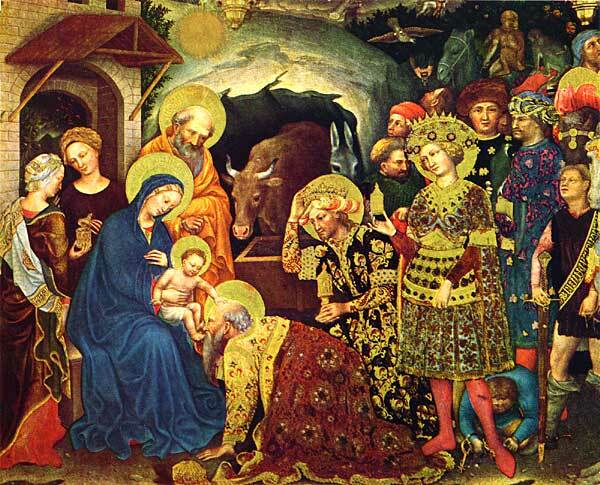 The Magi are believed to be priests from Arabia (Balthazar), Persia (Melchior), and India (Jasper/Casper). Back then priests where usually astrologers too, since they studied Heaven/the heavens, and they knew of Christ’s birth based on indications of the planets and stars. There may have more than just three, and the three gifts they brought are also common temple offerings to ancient gods, such as Apollo. That makes it even more fascinating, the idea that they were from different parts of the world, yes? I am thinking that there is a universal experience that mystics of all cultures and beliefs share in, so that is how they all, with the help of astrology, ended up on the same journey. Indeed! I think the Magi were also Jewish (Balthazar), Zoroastrian (Melchior), and possibly Hindu or Persian/Farsi (Jasper). Their names, places of origin, and religions may be literary symbolism for the mix of interconnected and inter-relating religions and cultures that span from the Mediterranean to India (thanks to Alexander the Great and then the Romans).